Cambridgeshire Constabulary need you help finding missing 13-year-old Taybah Khan. Taybah, who is originally from Bradford in West Yorkshire, went missing from a relatives house in Peterborough on Thursday evening. She hasn’t been seen since. Anyone with information about Taybah’s whereabouts should call police immediately on 101 or Crimestoppers, anonymously, on 0800 555 111. The mother of missing 13-year-old Taybah Khan is appealing for the public’s help to find her. Taybah, who is originally from Bradford in West Yorkshire, went missing from a relatives house in Peterborough on Thursday evening. She hasn’t been seen since. Rubina Khan said: “Our beautiful girl has been missing since Thursday. Our family is torn apart and completely broken. “I urge and beg anyone with any information, big or small to please come forward and help us bring her home where she belongs because this pain is unbearable. Launch of Rutland NHW smartphone app. 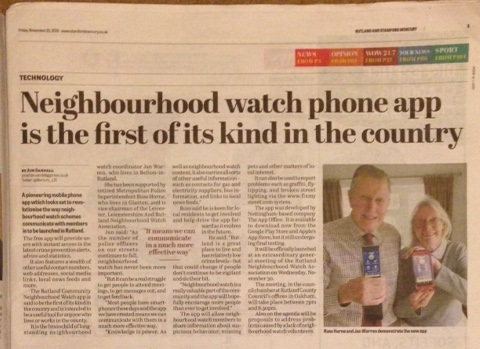 Rutland’s neighbourhood app is the first of its kind in the country.